She made her way carefully across the rocks and dried grasses, alert for snakes on the ground and dirigibles in the air. Many wouldn’t dare to cross the open territories in broad daylight–and on foot. It simply wasn’t done these days. Why submit yourself to such trouble when there were mechanical carriages criss-crossing the skies at all hours, gliding from Aerie to Aerie with the greatest of ease? And especially with the recent increase in vagabonds along the old coach roads and war brewing just across the border, ground travel could be downright dangerous. But such concerns were not for her. In every culture, no matter how technologically advanced, there are people who live along the fringes, surviving on the scraps and remnants of the general populace. 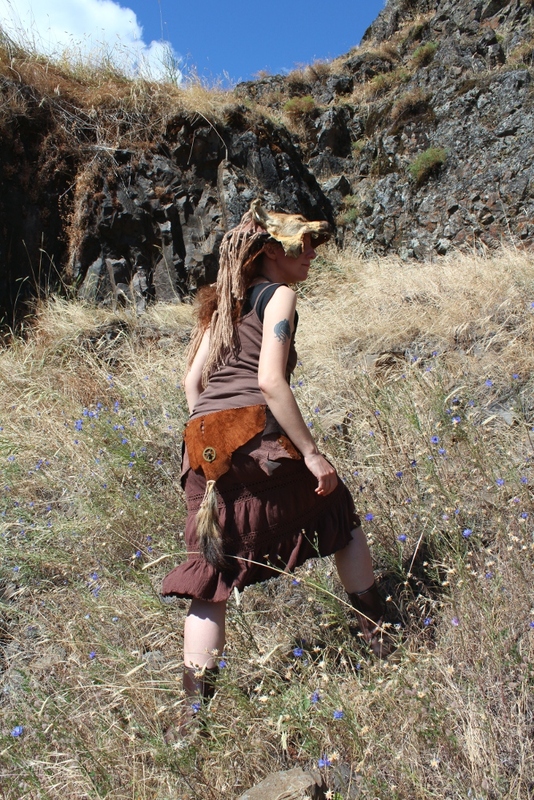 Even here, amid such brilliant advances and enlightened culture, scavengers still roamed the outskirts and badlands. Scavenging wasn’t an easy living, but she’d done well. She was healthy enough, and had hunted and traded for good (if worn) clothing instead of shambled rags. She’d fought her way to the top ranks of her clan, not too far below the Mother, and when she’d led the raid that expanded their territory into an abandoned Earthbound city, she’d been given first pick of the spoils. Not surprisingly she’d headed straight to the remnants of a museum, picking over dusty old taxidermy and what few metal bits hadn’t been already salvaged by the military. 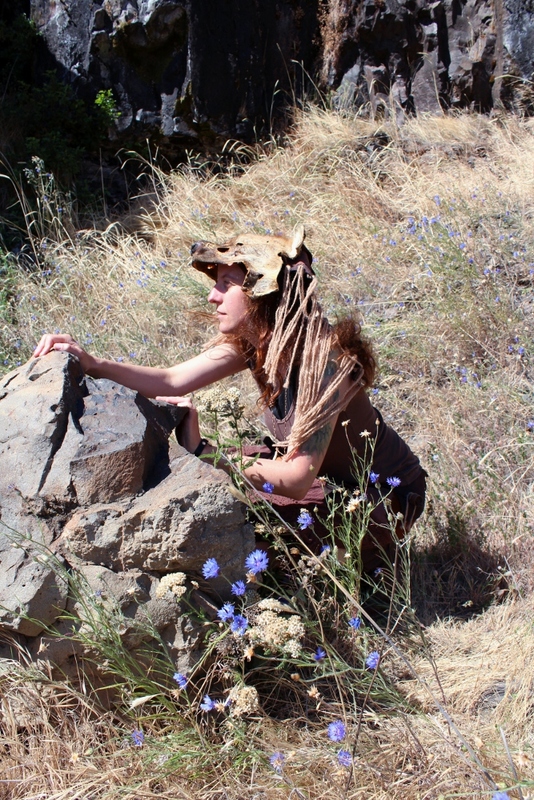 Some of her prizes were incorporated into her regal garb, but today she traveled lightly, wearing only the headdress, belt, and necklace to show her station to other scavengers. She hoped that today would be another windfall; there had been a battle in the clouds, and at least one ‘ship had fallen in flames, blackening the desert floor. Food and clothing would likely have not survived–to say nothing of people–but if the fire had not been too bad some of the wood and metal might still be good enough to take away. There were new younglings in the clan, and anything that couldn’t be sold for rations could be used in new winter shelters. And she could keep a few things for the Traders’ Meet, to barter for other scrap, or even some highly-valued handmade goods. Driven by these thoughts, she continued up the rocky slope toward the charred field. 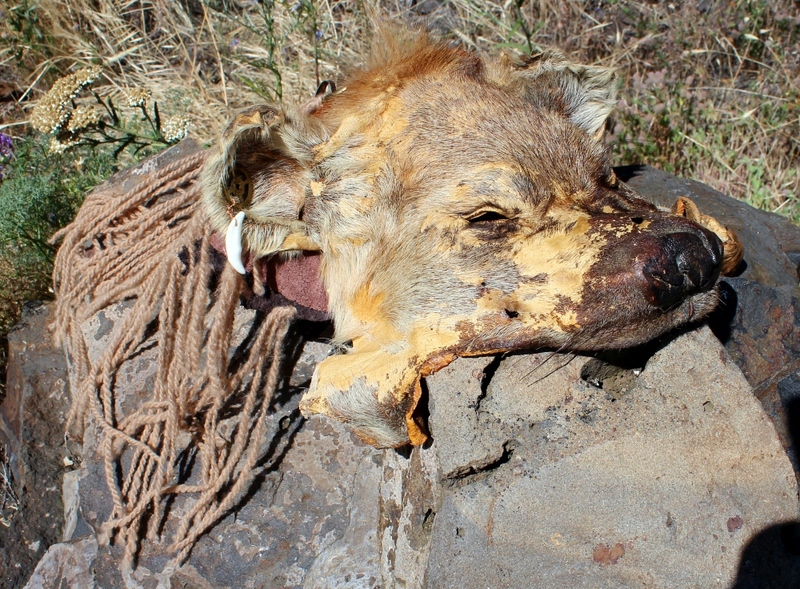 I was fortunate enough to get the head and tail from a vintage hyena hide a couple of years ago, and underwent a marathon art session over three days to make them into this project–the Steampunk Scavenger! You can get a little more background into the concept behind this piece, in the story snippet above, but here’s the nitty-gritty on the technical/artistic end of it. When I got the head and tail initially, the head was in especially bad condition; you can see the work that went just into reshaping it here. It was rather too beat up for full restoration, but I liked the well-worn appearance and decided to run with it. And while I’ve enjoyed steampunk for quite some time, I hadn’t really tried my hand at it as an artistic inspiration, but the concept I developed finally gave me a good excuse. 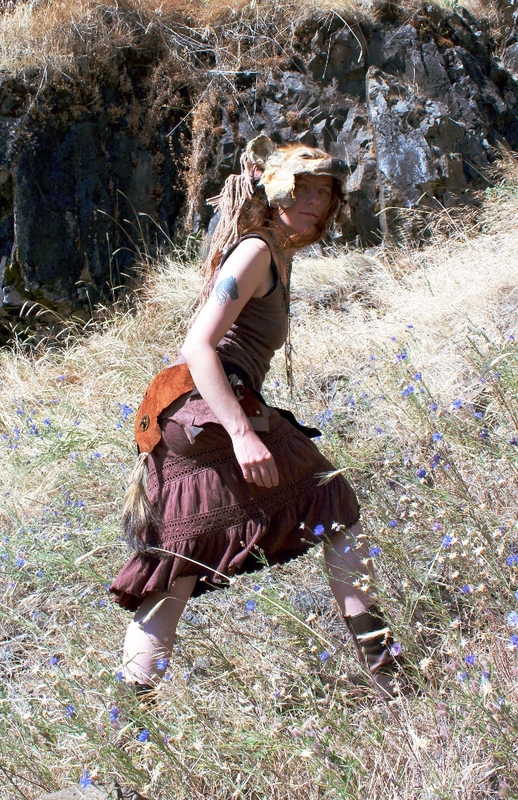 True to the scavenger’s nature, many of the components of this set–headdress, necklace, and belt–are secondhand, just like the head and tail. The suede leather is all upholsterer’s scrap that I managed to find at a Goodwill, the same Goodwill where I got the broken metronome whose guts contributed the gears and other brass bits. 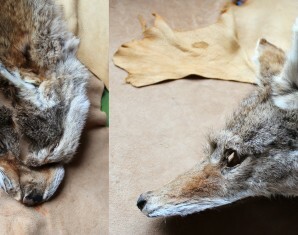 The copper wire is from old computer components, and the coyote teeth are taxidermy leftovers. Other random metal pieces, to include an old tigers-eye and metal ring, adorn the set. 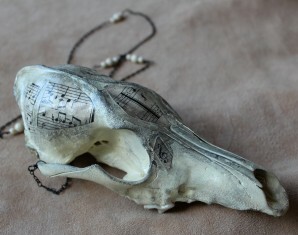 Of the new pieces, the bells were handmade and bought in a small shop on the central California coast. The yarn is alpaca, and was collected, cleaned, spun, and dyed all by hand by a local artisan I met at the Sherwood Fantasy Faire. 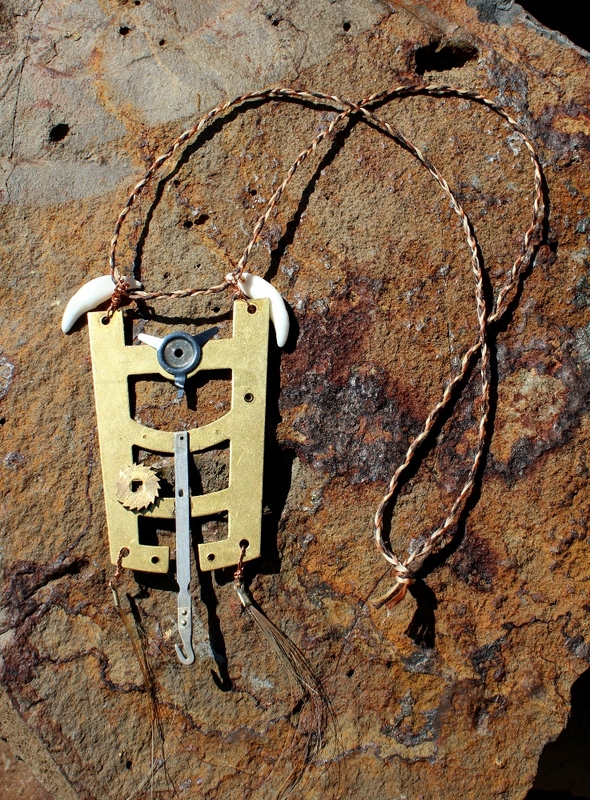 The rivets were bought from a small local leather shop, as was the artificial sinew for the necklace. The horse hair tassels were scrap from a larger project of mine. Everything is hand-stitched by yours truly. The headdress will fit most adults–there ARE straps to tie it on, but I had taken them out to condition the leather and forgot to put them back in before leaving for the photo shoot. It’s quite lightweight, and actually nicely balanced–I had very little trouble keeping it on without straps even though it was a windy day. Laid out flat it measures 31″ from tip of nose to the longest ends of the yarn in the back. I am 5’4″, and you can see in the pictures how it fits me. (And yes, that is a “gearring” in the right ear! There was already a hole in the ear; I just decided to make use of it!) 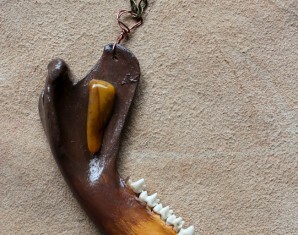 The pendant on the necklace is 5″ long, and the cord is 29″ long and hand-braided. All the pieces on the pendant are attached with steel epoxy, and despite being largely metal, it’s lighter than it looks! 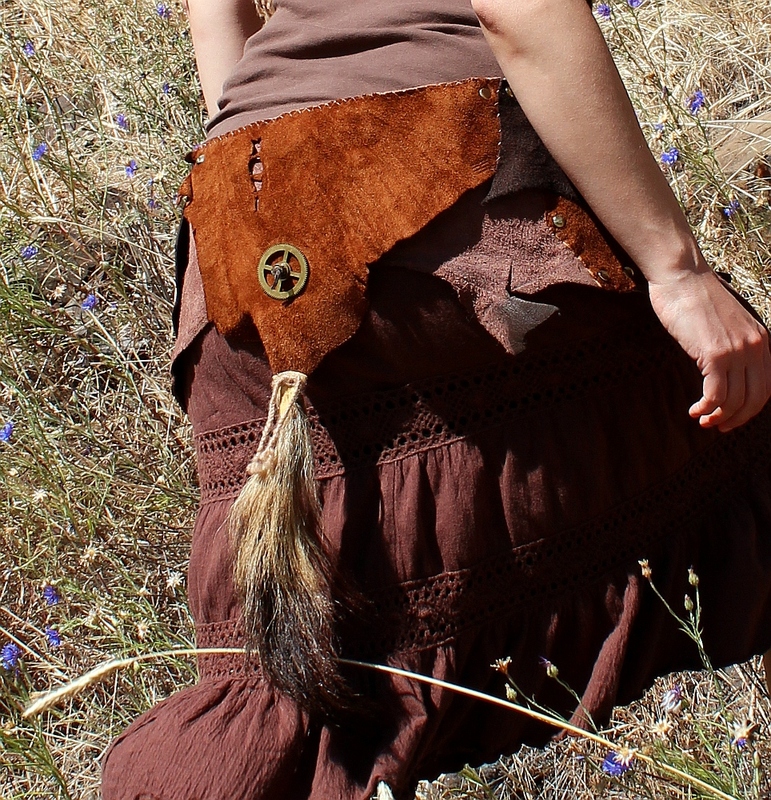 The belt is completely composed of that scrap leather in multiple layers; there are pockets, one on each side (hidden under the panels with the bells), because what scavenger wouldn’t have pockets? 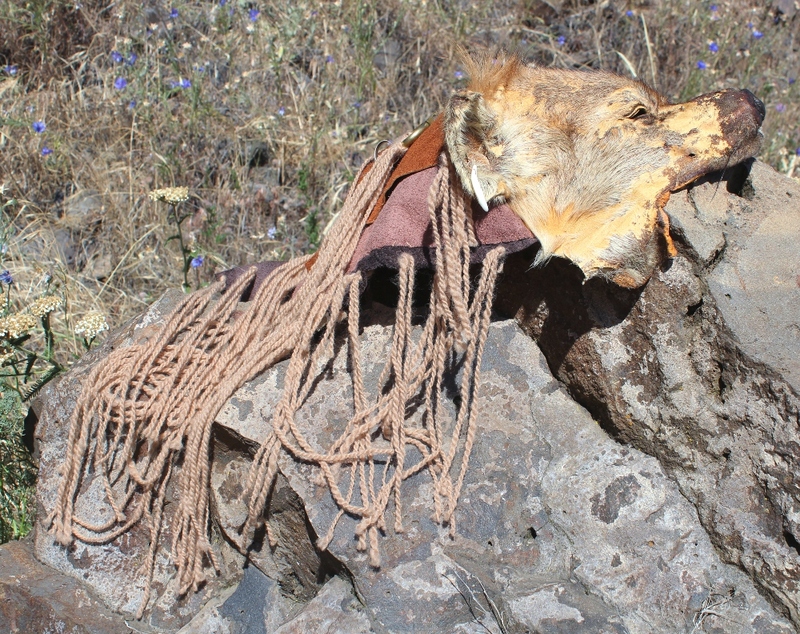 It is stitched and riveted both for practicality and appearance, with various decorative bits of metal, braided alpaca yarn, and coyote teeth. And, of course, the tail! The only spotted hyena tail I’ve ever gotten! The tail is 9 1/2″ curled (and likes to stay that way). The belt itself is adjustable with a brass buckle and leather strap, and will fit a waist/hips from 30″ to 45″, though if you need it larger I can just add in a longer strap. I was wearing it slung over my hips at the second-tightest setting (about 31 1/2″) to give you an idea of how it fit on me. The looser it’s worn, the more of the buckle and strap will show–they’re hidden by the front panels on the tightest settings. This set is in my personal collection; I simply liked it too much to let it go!